The command man bash produces a lot of output. What I desire would be to either search the results or print the results to paper. 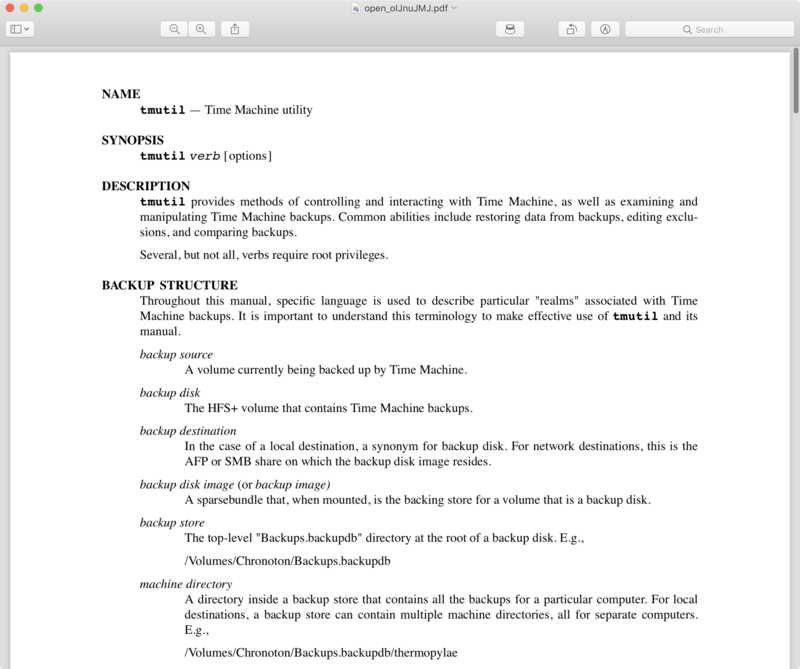 So, is there a way to convert a man page to a html and/or pdf document. I would prefer the answer work for not only man bash, but rather for any man page. I know the output from man bash has been posted on the internet, but usually these posts are not current. Yes, there are numerous tools to convert manual pages to HTML and PDF. If the file ends in .gz, then substitute the following. How do I convert Linux man pages to HTML without using groff? Another approach is to use the popular pandoc tool. This tool can convert manual pages to a wide range of formats. So, in Terminal, typing e.g. manp bash instead of man bash a PDF gets created, if it hasn't already been, and then opened by the app registered to handle PDF documents. The default is Preview, however on my system it's set to use Skim, as its search functionality is better then Preview and as a matter of fact will find the search string when Preview just will not. As a side note, typing just the command name in Terminal and then right-click on it and select Open man Page, displays it in a fully scrollable and searchable Terminal window, which is much better then typing e.g. man bash. where yourcommand is the one you want the man page of. $ man -t tmutil | open -fa "Preview"
Not the answer you're looking for? Browse other questions tagged terminal command-line bash pdf html . How to produce an A4-format pdf of an man page? What’s going wrong with printing my mini booklet?